Landscape design is just the first step; the installation brings it into reality. Now you get to sit back, enjoy the outdoor beauty around your home, and collect the compliments. Not so fast. While landscapers are able to incorporate elements such as hardscapes and native plant species that can help cut down on your outdoor yard work, nobody’s come up with a maintenance-free landscape yet. While some homeowners hire a lawn care or landscaping maintenance firm to take care of their yard work, most people do it themselves. While you don’t need a garage full of equipment, a few basic tools – in addition to the lawn mower – can help make things easier. Here are some tips on choosing the best ones for you. Forks and Garde n Spades: Both of these tools come in shafts of varying lengths; choose one that’s comfortable for you to work with. Metal shafts are heavier than wood, but they’re more durable. If you won’t be doing any heavy work, look for border spades and forks – the heads are smaller, making them lighter weight; they’re sufficient for most light tasks. Flat-end shovels are good for basic clean-up scooping; if you’re doing transplanting or other digging, choose one with a pointed end. Rakes: You’ll need two kinds – a leaf rake and a garden rake. Leaf rakes have wide open, long tines; these are great for leaf clean-up but also for raking up grass clippings and removing thatch from your lawn. A garden rake has shorter, heavier prongs and is good for spreading rocks or breaking up soil. 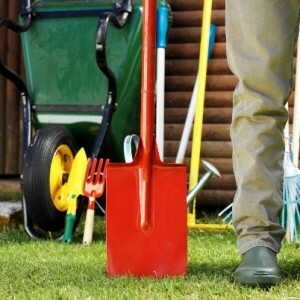 Hand shovel and trowel: These two are indispensible if you do any work in your garden, from planting bulbs to transplanting and dividing to removing large weeds. Look for models which fit comfortably in your hand. Brightly-colored handles make them easy to locate – hand tools can be easily mislaid outdoors. Either buy those with colored handles or spray-paint them in a color that will stand out from green grass and brown or black soil. Hand Pruners: These come in a variety of sizes, depending on whether you’re working with soft-wood shrubbery or harder canes. Choose those with a safety catch or lock and blades that cross over. Definitely try before you buy – make sure they feel right to you. A storage case or sheath is a plus to keep the blade tips protected. Pruning Saws: These tools are very helpful in keeping trees and shrubs well manicured, as well as dealing with dead branches. Some models have folding blades, but if you have a lot of shrubbery, you’ll find the fixed-blade variety is a better choice. Shears: These are sometimes also called grass clippers. These long-handled tools are great for cutting back perennials, spot-trimming grass, and lightweight hedge trimming. They come in a variety of weights, so try them out in the store before you buy – you’ll want them to be light enough for extended use if necessary. Depending on the size of your yard, there are a variety of other items you may find help with your lawn and yard care. Owners of larger properties will find wheelbarrows are almost a necessity. And there are a whole host of other specialty tools such as weeders, edgers, etc. But these tools listed here are the basics that should be in everyone’s garage or yard shed. Have questions about taking care of your landscape? Give us a call.